"So much more than a simple book full of stories, songs and pictures; it can be used all year long whenever we want a way to revisit the power and majesty of the Savior fulfilling his mission and ponder our place in it as well." "There would be no Christmas if there had not been Easter," taught President Gordon B. Hinckley. "The babe Jesus of Bethlehem would be but another baby without the redeeming Christ of Gethsemane and Calvary, and the triumphant fact of the Resurrection." With this deeper understanding given by a modern prophet, Latter-day Saints have an increased opportunity during the period from Palm Sunday to Easter morning to reflect upon the last days of our Lord's earthly ministry. In God So Loved the World: The Final Days of the Savior's Life, author Eric D. Huntsman takes us on a scriptural journey through the last week of our Savior's mortal life, culminating in His atoning sacrifice and joyous resurrection. The author, by drawing on his wide knowledge of historical context, cultural background, and biblical insights, increases our understanding of these momentous events and helps us draw closer to the Savior. Full-color fine-art paintings, photographs, maps, music, and topics for personal reflection are included to enhance our commemoration of Easter week. Brother Huntsman writes, "Each year has its rhythms with the passage of summer to fall, winter, and at last, again, spring. Holidays are part of that rhythm, helping us remember realities greater than mere seasons, and Easter, together with Christmas, can anchor each year securely in the promises of Jesus Christ." This beautiful volume suggests meaningful ways for Latter-day Saints to refocus their Easter celebrations on the culminating events of the Savior's ministry. Whether used as a personal or family study guide or as a model for a devotional celebration of Easter week, God So Loved the World is a must-have addition to the library of every Latter-day Saint. "We are here to influence the world rather than to be influenced by the world. If we could unleash the full influence of covenant-keeping women, the kingdom of God would change overnight." I have often wished that I could follow Jesus through His mortal ministry. In particular, I have wondered what it would have been like to follow Him through the final week of His mortal life. The witness of the four gospels gives us a glimpse into Jesus' teachings, miracles, love, voluntary death and triumphal resurrection. Reading the gospel accounts brings the sweet witness of the Spirit that Jesus is the Son of God and that He is the Savior and Redeemer of the world. 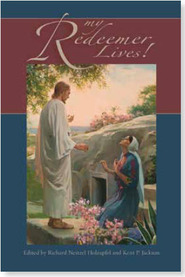 What Brother Huntsman has created is a book that enhances my journey through Jesus' last week in mortality. This book places the scriptural accounts of the four gospels into a series of chapters, one for each day of that last week. In addition, Brother Huntsman suggests historical, cultural, artistic and musical enrichment to the scriptural account. I gained new insights into the scriptural account as I read this book. More importantly, I feel like I know Jesus better as I follow Him through the final days of His life. Growing up in a home with two different predominant Christian religions gave me some insight into Holy Week and palm Sunday, but I never fully understood the meaning of The Passion of Christ. This book brings the last week of Christ's mortal life into focus. After reading God So Loved The World, I have a deeper knowledge of the events that led up to his Crucifixion and the ressurrection. Eric Huntsman uses scriptural passage from the Synoptic Gospels, words to hymns, sidebars and text boxes to weave a full portrait of each day of the week leading up to the final events of Easter. He also adds geographical photographs of surrounding areas Bethany and Jerusalem, plus fine art depictions of mentioned scenes to appeal to the visual learner. Mr. Huntsman's rich knowledge and personal feelings of Christ's sacrifice highlight depth and meaning that goes beyond just facts. As a society we tend to place a huge focus on Christmas and forget to prepare ourselves for the miraculous event that occurred at the garden tomb. God So Loved the World points out numerous times that "without Easter there would be no Christmas." Having grown up in the church, at times it is difficult to find a tradition in which to celebrate Easter. I have struggled over the years to come to a better understanding and remembrance of this sacred day and have had too many years where I did not realize it was Easter morning until it had passed. After reading this book by Eric Huntsman, I have found my heart changed. I look forward to celebrating the Holy Day by remembering what the Savior did leading up to the glorious morning we celebrate. This book was easy to read and follow the steps that the Savior was taking over two millenia ago and if for only a few minutes feel as if I was walking those steps with him. I found myself not only at the cross or the empty tomb, but one the streets as the Savior rode into Jerusalem on Psalm Sunday, in the temple listening to him teach, and in the Garden of Gethsemane wanting in some way to render assistance to the One suffering for my sins. My family and I can use this book on a yearly basis to teach our children the meaning of Easter and to re enforce in our hearts the testimony of the Atoning Sacrifice of Jesus Christ. This is a must have for every family, in which to help bring the true meaning of Easter home each and every year. This really is a great book. What I especially like about it is a melding genres, art, music and text, to help add to the spirit of Easter. My wife and I are looking forward to being able to read day by day the week leading up to the death and resurrection of our Savior. This year and for years to come, to add to it our own thoughts and testimonies of Christ. This is an excellent book if you're looking for real ways to actually celebrate Easter. There are so many books that help us celebrate Christmas, but none for Easter...until now! Love this book! Getting it for friends and family. This book is a great resource for families to deepen the meaningfulness of their Easter Celebration. I loved this book! It walks day by day through the Savior's last week, starting with Palm Sunday. I had studied these events numerous times independently, but never understood the richness of the symbolism - or how the events all fit together to testify of Jesus' divinity. Brother Huntsman seamlessly weaves his knowledge of ancient languages and history with his faithful understanding of the purpose of the Atonement and Resurrection. We are using this as our FHE text for the month. We are all learning from it! I highly recommend it as a wonderful tool to enrich your family Easter celebrations and traditions. 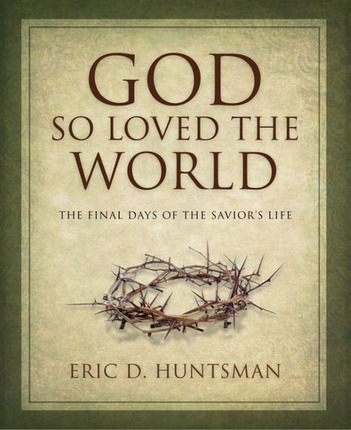 Eric Huntsman’s timely volume, “God So Loved the World,” is a stunning example of the way that faith and scholarship can come together to produce a book that will both add to your testimony of the Savior’s atoning mission as well as enrich and deepen your understanding of the scriptures. 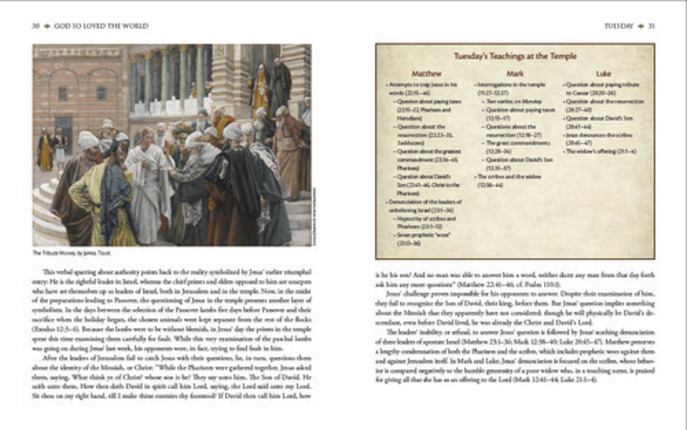 Each chapter of the book examines one day of “Holy Week,” the final week of Jesus’ life. In addition to detailed commentary on the events and teachings of each day, there are photographs, artwork, sidebars, and text boxes that are designed to supplement and enrich your study of the scriptural accounts. The book is visually very impressive, and is particularly noteworthy for the liberal use of artwork drawn from the rich body of Christian religious art. 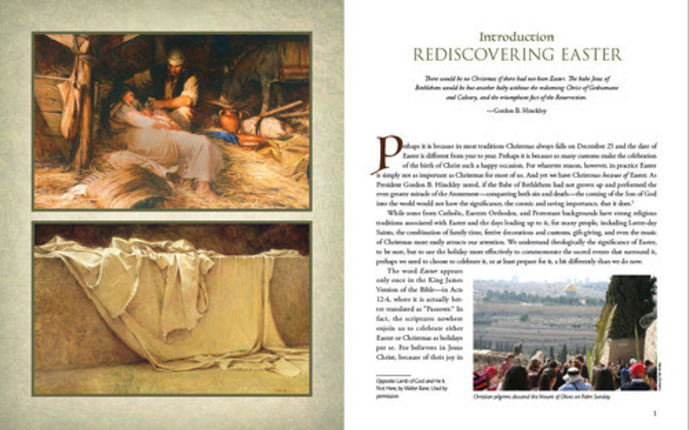 Though some selections are the familiar works of LDS artists, most of the art will be new to many readers. Each work of art has been carefully chosen and is used not just to illustrate specific scriptural events but often even to evoke the mood appropriate to the events of that day (see “Grey Day at Golgotha,” pg 70). Photographs of important locations in and around Jerusalem have also been included to help the reader better understand the geographical and archaeological setting of the gospels. From a devotional perspective, this book is designed in such a way that any family or individual can use it to guide their study and reflection of the events of Jesus’ final days. The text boxes are often filled with explanation that brings in unique LDS insight and restoration scripture. Musical suggestions that resonate with the themes and events of each day are also included with each chapter to be incorporated into one’s Easter worship. As with the artwork, the musical selections are drawn not just from the familiar hymns of the church but from some of the great works of classical music (such as Handel’s “Messiah” or Bach’s “St. Matthew Passion”). This book will be equally rewarding for the serious student of the scriptures. The text itself is replete with historical, linguistic, and cultural commentary that help to illuminate the unique perspectives, themes, and emphases of each gospel author. Several of the text boxes delve deeper into various historical or linguistic matters and introduce the reader to important issues of biblical scholarship. A glance at the ample footnotes demonstrates the breadth of scholarship that is represented, and an impressive bibliography will allow those desiring additional study several avenues for further inquiry. As such, this is an excellent resource for preparing talks, lessons for Sunday School or family home evening, or for simply deepening one’s understanding of the scriptures. Huntsman’s masterful combination of both a scholarly and devotional approach to scripture study makes this a book that will appeal to a broad audience. At a time when it is all too easy to get caught up in the cultural trappings of Easter, this book will help our worship of the savior to become more focused, and give us a greater understanding of the meaning and significance of his atoning sacrifice.